The Z-22 Vacuum Tube – a scientific breakthrough or an odd creation by a inventor long past his prime? Well, seeing how Spliner is more than a little eager to get his evil hands on it, I’d say… the former. Luring Professor Neely And The Death Ray Of Doom‘s protagonist into a (rather obvious) trap to get it might not have been his brightest moment though, as now more than ever, the odds are in Neely’s favor. More or less. See, while certainly brighter than virtually every other character in this sciency adventure, Neely did still get tricked into going to Spliner’s mansion under the guise of an award waiting for him, only to find himself immediately imprisoned. Greed will get the better of us all at some point, and at least he’s still alive, ya know? On top that, provided he can figure out how to escape captivity, he’s now within arms reach of Spliner, which gives him a good chance to hopefully put an end to whatever evil scheme he’s cooking up with that recently ‘acquired’ vacuum tube (spoiler for those who didn’t read the name of the game: it involves a death ray of doom). 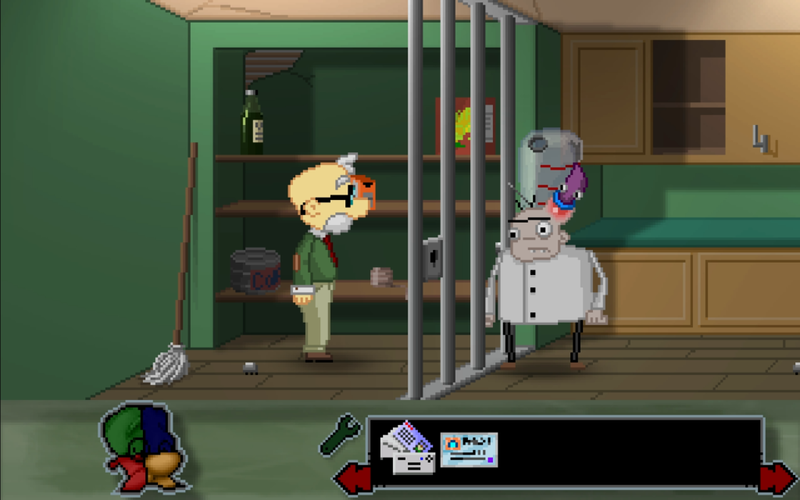 While the game, at its core, is very much rooted in classic point ‘n click adventuring – commands limited to look, use, take and talk – I did encounter a surprisingly interesting mini-game while playing; a neat addition in a genre mostly revolving around inventory puzzles and lengthy conversations. Aside from that, it seems very much your typical pointy and clicky experience, picking up items to then use them on objects in your surroundings to progress, characters to drill for information, mayhap even chat up a door or two while you’re at it. Yeah, go ahead and give that a go – the outcome just might surprise you. Or maybe it won’t. Either way, you won’t know unless you try, much like how Spliner won’t be stopped in Professor Neely And The Death Ray Of Doom, unless you point (and click) Neely in the right direction. Professor Neely And The Death Ray Of Doom is available on itch.io.